Sentraal-Suid Co-operative Ltd (SSK) is a diversified agricultural input supplier and service provider which operates in the Western, Southern and Eastern Cape. Their head office is located in Swellendam and the organisation has been serving its members as a co-operative for the past 87 years. SSK pursues to ensure the prosperity and survival of the organisation and its members by promoting growth and diversification, whilst maintaining stability in the community it serves. It does this by maintaining low-input costs, stocking a wide variety of products, service delivery of superior quality, and assisting its members in the marketing of their products. Since 2006, SSK has become actively involved in empowerment initiatives in primary agriculture in its geographical service area. This involvement arises from SSK’s desire to contribute to the realisation of agricultural transformation in South Africa. The objectives of such projects are the creation of sustainable commercial farms for emerging farmers and the promotion of a farming culture of entrepreneurship and dedication where farmers will be empowered to develop into full scale commercial farmers. In order to do that, it is imperative that they will have access to sufficient funding to finance their own production inputs as well as creating a healthy living standard for their families. Sufficient funding as well as continuous mentorship programmes and assistance with successful credit and administration management were the crucial factors identified by SSK in ensuring the success of such projects. Access to sufficient arable and usable land. A passion for farming and all it entails. Holistic farm planning with focus on precision farming to ensure efficiency and competitiveness. Financial control and budget planning to prevent mismanagement of funds. Goal orientated mentorship in order to ensure optimal production of agricultural products. To address the crucial areas listed above and to facilitate membership of SSK, a Membership Assistance Fund was established. Prospective members apply for 4 000 shares in SSK at a total nominal value of R4 000. This amount is lent to the member at zero interest with no set repayment date. All member bonus declarations are automatically applied to this debt until the loan is repaid in full, after which member bonuses will be paid out in the ordinary course of business. Every member making use of this initiative furthermore qualifies for a credit facility guaranteed by the shares held in SSK. The active mentorship programme involves assistance with production plans, land preparation budgets, crop budgets and environmental plans. Monitoring and evaluation by dedicated SSK Agronomists, Agricultural Economists and Credit Managers take place on a continuous basis. The production plan outlines the activities that need to be executed in a specified time period; the objectives for the activities; as well as performance indicators used to monitor and assess progress in order to pro-actively identify gaps and opportunities. The land preparation budget is created to address the costs in preparing for production of crops and should put the emerging farmer in a position to farm the crops throughout the year on a normal production cost budget. The annual crop budget serves to quantify the costs of all expenditure necessary for a full year crop production. The environmental plan sets the guidelines for the utilisation of the total land area to prevent over exploitation. 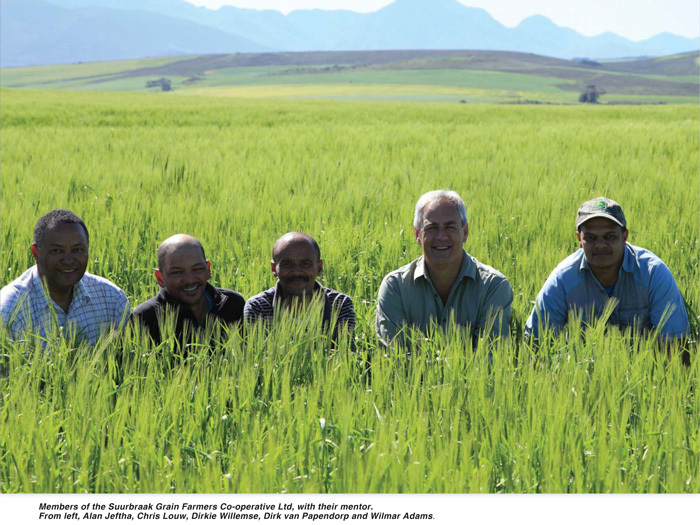 The Suurbraak Grain Farmers Co-operative Ltd was established in 2011 and currently cultivates 700 hectares summer grains. The Slangrivier Saambou Boere Co-operative Ltd was established in 2012 in the Heidelberg district. Approximately 172 hectares summer grains are currently cultivated. 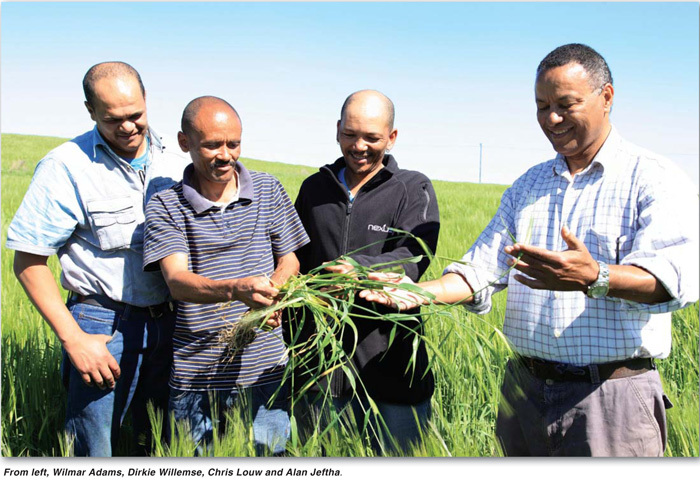 Olieboomskraal Co-operative Ltd was established in 2015 in the Heidelberg district and cultivates 232 hectares summer grains. Several other individual emerging summer grains, tobacco and cattle farmers are currently beneficiaries of the SSK community mentorship programmes. SSK membership of previously disadvantaged individuals increased from 1% in 2013 to 6% in 2017. Anticipated outcomes of these projects are that farmers are given the opportunity to build enough capital during a five-year funding period to become self-sufficient. Van Papendorp believes that the SSK model of gradual, but sustainable empowerment will ultimately make a success story of agricultural transformation in South Africa. Article submitted by Annelie van Wyk, Senior Manager, Marketing and Communication, SSK. For more information, send an email to Annelie.vanWyk@ssk.co.za.